Kids will love this easy-to-make wrap that's not too spicy for little eaters. Spread tortilla with cream cheese product, then salsa. Top with turkey, cheese and lettuce. Roll up tightly. Wrap in plastic wrap. Serve with a crisp mixed green salad tossed with your favourite Kraft Dressing and fresh fruit on the side. 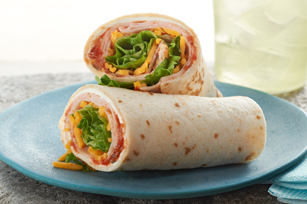 This kid-pleasing wrap can be stored in refrigerator up to 24 hours before serving.